Before you head out on the lake with your snowmobile please review the Pewaukeee Lake Winter Rules regarding snowmobile use on the lake. 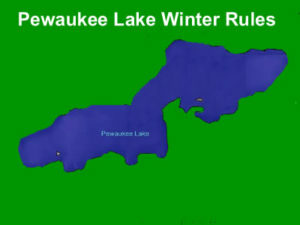 Pewaukee Lake is divided into zones: Shore Zone and Lake Zone. Different rules apply in each zone. Shore Zone is defined as any area within 500 ft of the shoreline. You are not allowed to park your vehicle in the Shore Zone from 1:30 a.m. to Dawn. Lake Zone Lake Zone is defined as the area more than 500 ft from any shoreline. Maximum speed limit in the Lake Zone is 50 mph during daytime hours and 25 mph at night (snowmobiles only). All vehicles must slow to 10 mph when within 200 feet of other people, ice shanties or parked vehicles. No vehicles are to operate on the lake from 1:30 a.m. to Dawn. The complete list of winter rules for Pewaukee Lake can be found on the Village of Pewaukee Police Department’s Web site.